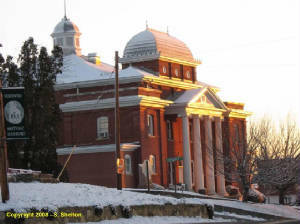 The Town Hall is housed in the 1888 Stack-Bickett law office, located behind the historic Stokes County Courthouse on Courthouse Circle. Listed in the National Register of Historic Places, the office has been used by numerous attorneys through the years, including Gov. Robert Glenn. It was acquired by the town for use as the Town Hall in 1998 from the family of Congressman Ralph Scott. Congressman Scott was elected to the U.S Congress in 1956 and served for 12 years. Memorabilia from Congressman Scott (who was the last attorney to use the building as an office) and other photos and historic objects are on display in the town hall. Danbury operates under a Mayor/Council form of local government. The mayor is elected every two years for a two-year term. Council members serve four-year terms--two members are elected every two years, creating staggered terms. The town council meets monthly, on the 4th Wednesday of each month at 7:00 pm in the Ralph Scott Memorial Town Hall. Monday-Thursday - 9:00 a.m. - 1:00 p.m.
For water and sewer issues, contact Stokes County @ 593-2415. Danbury administers its own zoning ordinance both inside the town and in the Extra-Territorial Jurisdiction [ETJ] that extends one mile out from the town limits. Zoning is supervised by a planning and zoning board. A current zoning map is maintained and available for view in the Town Office during regular office hours. Click on the "Departments" page for more information. Water and Sewer service are available to town residents and businesses. The Danbury water and sewer systems are owned and operated by Stokes County. Contact Stokes County for any water or sewer questions: Service/maintenance/billing: Stokes County Public Works--593-2415. The town provides street lights and weekly curbside residential garbage pick-up. Click on the "Departments" page for more information and for the garbage pick-up schedule.